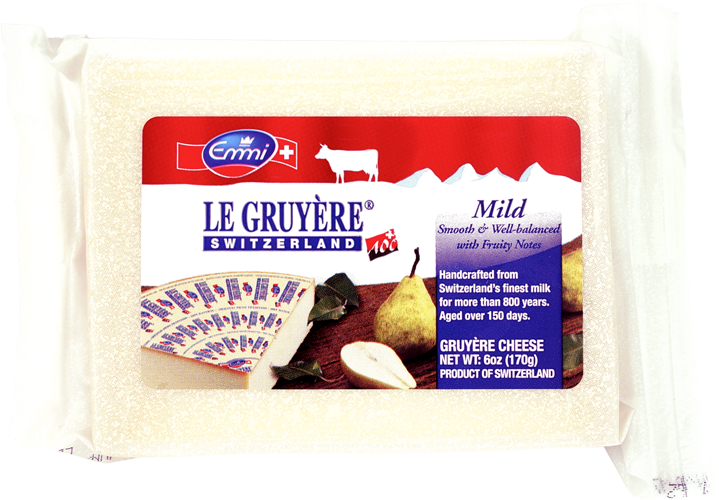 Le Gruyère cheese enjoys a rich history dating back to the 12th century when Swiss cheesemakers began crafting this deeply flavorful cheese. Today we follow the same recipes and strict guidelines to earn the AOP label. Not only do farmers feed their cows a naturally sustainable diet of pasture grass in the summer and hay in the winter. Our cheesemakers also incorporate only the freshest milk supplied twice a day from nearby farms. We then craft exclusively in copper vats to impart a unique, complex character that connoisseurs crave. As Le Gruyére AOP slowly matures in the cave-like atmosphere of our cellars, each wheel is delicately turned, lightly brined and brushed. This brings out the inimitable flavor featuring notes of candied walnuts, dried fruit and spice. Serving Size 1 oz (28g), Servings Per Container: Varied, Calories 110, Total Fat 9g (11% DV), Sat. Fat 5g (27% DV), Trans Fat 0g, Cholest. 25mg (8% DV), Sodium 170mg (7% DV), Total Carb. 0g (0% DV), Fiber 0g (0% DV), Sugar 0g (Includes 0g Added Sugars, 0% DV), Protein 8g, Vitamin D .3mcg (2% DV), Calcium 250mg (20% DV), Iron 0.1mg (0% DV), Potassium 20mg (0% DV). * % DV = % Daily Value. CONTAINS MILK. KEEP REFRIGERATED. Cellar masters and members of the interprofession of Le Gruyère AOP oversee our lengthy aging process. 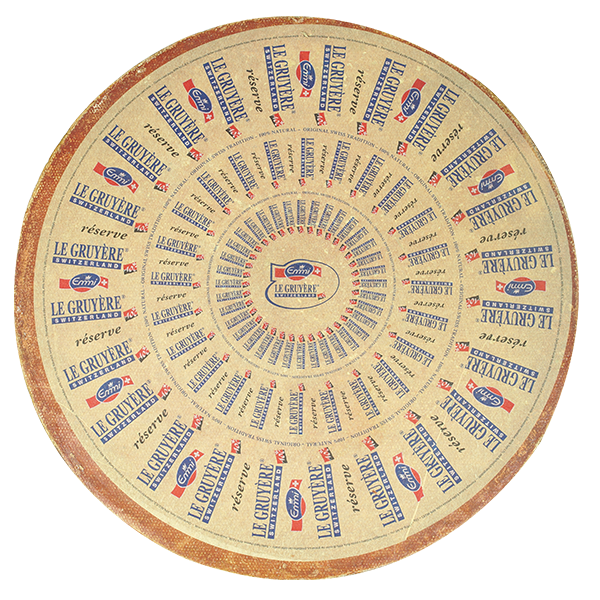 After each monthly inspection, these experts determine whether each wheel is perfected enough to reach the status of Le Gruyère AOP Reserve. This care and crafting brings out distinct earthy flavors with undertones of fruit, nut and a sweet, lingering finish. Serving Size 1 oz (28g), Servings Per Container: Varied, Calories 110, Total Fat 9g (11% DV), Sat. Fat 5g (27% DV), Trans Fat 0g, Cholest. 25mg (8% DV), Sodium 170mg (7% DV), Total Carb. 0g (0% DV), Fiber 0g (0% DV), Sugar 0g (Includes 0g Added Sugars, 0% DV), Protein 8g, Vitamin D 0.3mcg (2% DV), Calcium 250mg (20% DV), Iron 0.1mg (0% DV), Potassium 20mg (0% DV). * % DV = % Daily Value. CONTAINS MILK. KEEP REFRIGERATED.